It is my sad duty to report that in the early hours of this morning, criminals struck at the beating heart of middle class Worcester Park. 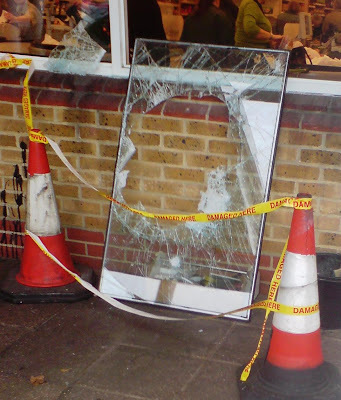 Yes, ladies and gentlemen - Waitrose has been broken into. The rapscallions (presumably wearing hoodies) smashed their way through Waitrose's window and ran amok amongst the shelves of Veuve Clicquot, leaving this morning's shoppers to shake their heads in horror and wonder what the world is coming to.